정조필(正祖筆) 는 조선시대 정조(재위 1776∼1800)가 그린 그림으로, 바위 옆에 서 있는 한 그루의 파초를 그렸다. 정조는 시와 글에 능하였을 뿐만 아니라 그림에도 뛰어났다고 한다. 이 그림은 가로 51.3㎝, 세로 84.2㎝ 크기로 단순하면서도 균형적인 배치를 보여준다. 먹색의 짙고 옅은 정도 및 흑백의 대조는 바위의 질감과 파초잎의 변화를 잘 표현하였다. 그림 왼쪽 윗부분에 정조의 호인 ‘홍재’가 찍혀 있다. 형식에 치우치지 않은 독창적인 묘사가 돋보이는 이 그림은 글씨와 그림 및 학문을 사랑한 정조의 모습과 남종화의 세계를 보여주는 것으로, 국화도(보물 제744호)와 함께 조선 회화사 연구에 중요한 자료가 되고 있다. The painting titled Pachodo (Painting of a Banana Tree Next to a Rock) was produced by King Jeongjo (r. 1776-1800) of the Joseon Dynasty, who was said excel in poetry, writing and painting. 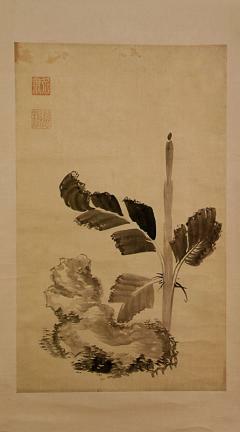 This painting measuring 51.3 cm in width by 86.2 cm in length exhibits a simple but well-balanced composition. The variations in the strength of the ink and the contrast between black and white express the nature of the rock and the change of the leaves well. A seal with King Jeongjo's pen-name ‘Hongjae’ is printed on the upper left-hand side of the painting. The informal, unique touch of painting is the chief characteristic of this picture, revealing King Jeongjo's love of writing, painting and learning, as well as the painting style of the Namjong group. It is regarded as an important art work for studies on the painting history of the Joseon Dynasty, as it is one of the few paintings, along with Gukhwado (Chrysanthemum; Treasure No. 744), produced by King Jongjo.